The Xpand X102 3D shutter glasses are designed to work with your 3D television. They are more substantial than the traditional 3D glasses that you always get at the movie theater. But, you have to pay for the privilege. The first thing that you notice about the Xpand 3D glasses is that they’re kind of cool looking. The body is red and black, and the glass ear pieces wrap around your head. The glasses are large at 8.5 inches long by 5.5 inches wide by 3.2, but relatively lightweight at 6.4 ounces. The lenses are a nice size. So, you definitely won’t have to worry about seeing any of the frame in your line of site. These glasses are also extremely comfortable. It almost doesn’t feel like you’re wearing glasses at all. The major advantage of this product is that it comes with a built-in DLP chip, which improves the overall viewing experience. This technology synchs the image together so the image always looks clear. You also don’t need an emitter with these glasses, eliminating the need to set up this component. The image created by the technology is about as perfect as you can get. You see all the details, and the colors are quite vibrant. 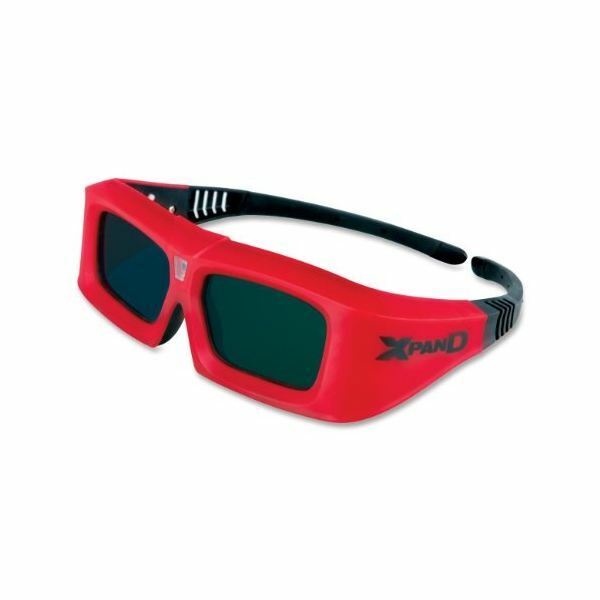 The Xpand X102 3D glasses are designed specifically for Sharp 3D projectors and Mitsubishi and Samsung DLP TV. The glasses will not work with any other type of projectors or TVs. So, if you have any other type of television, these are not the glasses for you. There are, however, some problems with these glasses. The glasses lose power the farther away from the television that you get. The perfect view that you get at 4 feet away from the TV disappears when you get 10 feet away. The glasses may flicker a bit. There’s also the problem of the cost. Depending on the discounts, these glasses run from about $99 to nearly $150. If you can get them around the $100 price, then they’re very competitive. But, if they aren’t running any deals at the moment, you’re looking at paying a top-end fee for the glasses, considering 3D glasses usually top out at $175. Plus, the battery life isn’t the greatest. The glasses come with extra batteries and the battery change tool. The batteries are supposed to last 100 hours, but some people have experienced problems with the batteries running out at around 50 hours. You can order replacement batteries from Sony that are supposed to last 250 hours, but that’s an extra expense. Overall, the X102 Xpand 3D shutter glasses are extremely comfortable, and they generally produce a very good picture. The batteries are a bit of a downer, and the screen flicker problem may be a deal breaker. You should, however, try to avoid paying the $150 price, and wait for the glasses to go on sale.